Yet you delight more in breaking them. Like children playing by the ocean who build sand-towers with constancy and then destroy them with laughter. And when you destroy them the ocean laughs with you. Verily the ocean laughs always with the innocent. 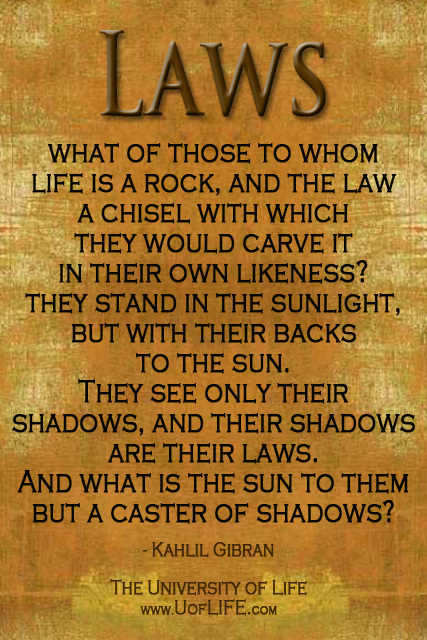 But to whom life is a rock, and the law a chisel with which they would carve it in their own likeness? What of the cripple who hates dancers? What of the ox who loves his yoke and deems the elk and deer of the forest stray and vagrant things? What of the old serpent who cannot shed his skin, and calls all others naked and shameless? And of him who comes early to the wedding-feast, and when over-fed and tired goes his way saying that all feasts are violation and all feasters lawbreakers? What shall I say of these save that they too stand in the sunlight, but with their backs to the sun? They see only their shadows, and their shadows are their laws. And what is the sun to them but a caster of shadows? And what is it to acknowledge the laws but to stoop down and trace their shadows upon the earth? But you who walk facing the sun, what images drawn on the earth can hold you? You who travel with the wind, what weather-vane shall direct your course? What man’s law shall bind you if you break your yoke but upon no man’s prison door? What laws shall you fear if you dance but stumble against no man’s iron chains? And who is he that shall bring you to judgment if you tear off your garment yet leave it in no man’s path? People of Orphalese, you can muffle the drum, and you can loosen the strings of the lyre, but who shall command the skylark not to sing?